Anyone dealing with incontinence likely has heard about adult diapers but finding the right adult diapers for your needs can be challenging. One brand of diapers that continues to be among the top sellers is Prevail. Prevail protective underwear can provide you with the discreteness that you are looking for and it can easily give you an affordable solution to managing incontinence. 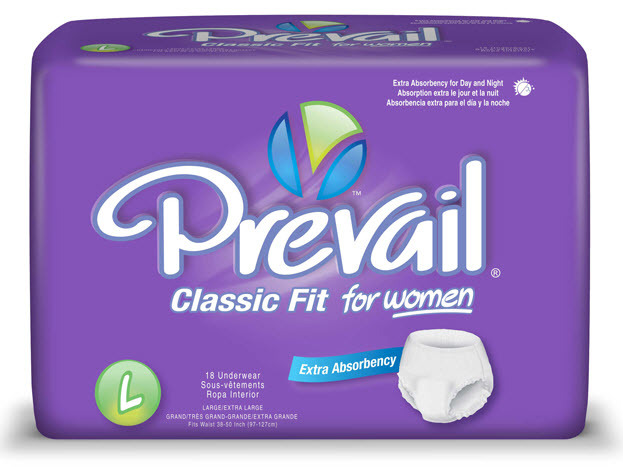 Prevail adult diapers come in a variety of options for men and women, making it easy for you to find adult diapers or products that can help you in managing incontinence properly. One of the best reasons to choose the Prevail line over other incontinence product lines is due to the comfort and fit of their products. They have adult diapers that are actually sized specially for both genders, making them custom fit to your body. Some of the Prevail diapers to consider are the Prevail Breezers. This is one of their most popular products as they come with a number of absorbent qualities but they are wonderful because they are great at holding in excess urine. The difference with this line of incontinence underwear to others is the way the diapers have been manufactured. Instead of having just a diaper that is covered with a plastic coating it actually has an extra layer of fabric. This is used to help allow air into the diaper. This cuts down on odor problems and it can also aid in helping with pulling the urine away from the skin. The cost of the Prevail Breezers usually runs about $50 for a pack of 72. When you are buying incontinence supplies you need to consider your budget. The incontinence supplies cost can add up in a hurry so you need to know what you can afford. If adult diapers are too expensive you should consider looking at other options like using washable incontinence underwear. This is a cost effective way to help you manage incontinence and many find that these products tend to be more comfortable as they fit better to your body. They also look like your regular underwear so this can make it much easier for you to be able to manage incontinence in a discrete manner. What about problems with incontinence at night? You should consider getting some incontinence supplies that can help you during the night. Incontinence bed pads are a great option to use at night to protect your bedding. It makes the cleanup of your incontinence problems easier to deal with. Adult diapers for overnight protection are another great option to consider. Prevail provides a number of great options for you to consider to protect yourself overnight. One of the diapers that is commonly recommended by incontinence users is the Prevail PM Night Time Diaper. This diaper is a great option because it helps to prevent against leaks. The way the night time diaper works is by adding an extra layer of protection around your legs. You actually have leg cuffs that are used to hold in the urine and to prevent it from escaping from the diaper at night. One of the things that also makes Prevail incontinence products great is how easy they are to find. You can buy them online but a lot of the Prevail underwear products are actually found in stores. This can help you out as you can quickly grab the supplies that you need in a hurry if you do run out. If you want to manage incontinence in a discrete way, you need to consider trying out some of the various Prevail products that are on the market to save money and to find your best option.